What is Modern Energy Art? Follow The Guild of Energists's board Energy Art on Pinterest. "You are too literal!" is a favourite put you down among arty folk. It is a variant on the "Fear of the Obvious" which I have written about and ranted over for many years now. Essentially, art students and literary students are entrained to become blind to the obvious, and the literal, by being punished for being obvious and literal. This leads to a mental movement that becomes quite literally (!) the psycho-path. Einstein rightfully observed that "When the solution is simple, God is smiling." The Obvious is that simple, elegant solution to the problem. It makes no difference if this is a maths problem, an interior design problem, a "psychology problem" or any kind of problem at all. There is a clear path to a solution, and you will literally (!) never, ever find it - if you are entrained to ignore the obvious. Telling people not be literal, because being literal is a bad thing, is the first step on the psycho-path from which there is no return, no escape. It is a labyrinth that will keep people entrapped for their entire life, and leaving them wondering on their death beds where it all went so spectacularly wrong. You don't get anywhere by following the psycho path - only into more and more insanity, chaos, entropy and eventually, implosion. The problem with punishing youngsters for being too obvious, being too literal, is that they've never had a chance to be obvious or literal FIRST. They don't even know what that is, to go straight to the obvious; they're too young, they don't have the experience yet. 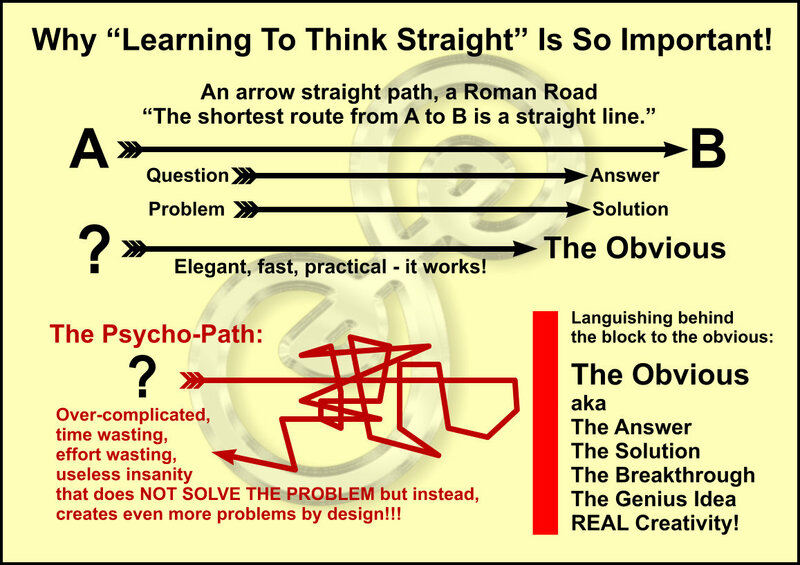 The "straight thinking" is choked off before anyone had even a chance to learn to think straight! Now why do they do that? Why are art students told their picture of a flower is "too literal," writing students are told their description of "My heart is heavy like a stone" has been said too many times before; why are people being turned away from the obvious? It is a misunderstanding about the processes of creativity. People don't understand creativity and try to "get to it" in many weird ways - through drugs, through pain and suffering, through emotional self mutilation - and by trying to avoid the obvious. By being somehow weird, and peculiar, and different. Believing that creativity is some kind of insanity. 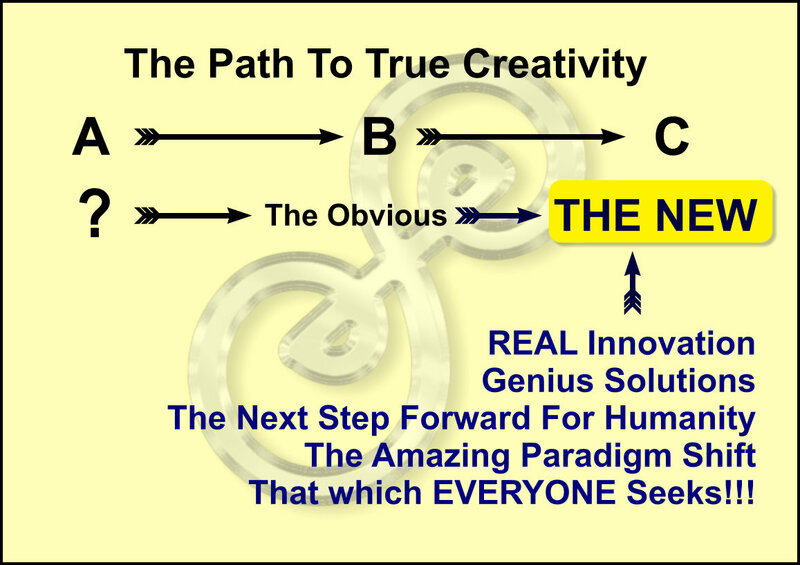 Creativity - true creativity, making something NEW - is to be found on that path to the obvious - because you go from that obvious to the NEXT OBVIOUS, and the next obvious is obviously NEW. It's amazing. It's a breakthrough! Nobody has ever seen or heard of this before! And not just that. It is right, it is true, it is a paradigm shift! The obvious and the real are interchangeable. Going for the obvious, the real, what's really there, first of all is the first step stone on the path to the new, and to real creativity. So be literal. As literal as possible. Once you know the obvious, the literal, then you can move on from there and abstract to your heart's content. Me, I will be looking for the next obvious, the next real. So people might say that NOISE isn't "real art because it's way too literal" - but stand in the same room with it, and you'll find it has power, and purpose, and a distinct message people can engage with, you could say it has a voice. 👉 Further Information: Being Too Literal ...? Join the Modern Energy Art group on Facebook! Do you love ENERGY? Do you love working with energy, playing with energy, talking about energy and discovering more about MODERN energy? Then join The Guild of Energists today! THE place to be for MODERN energists. Check out "Why Artists Should Join The GoE" article here. Text & Images © Silvia Hartmann 1993 - 2019. All Rights Reserved.